First of all throw away all those books about everything architecture, secondly delete all those special modeling tools, third forget any architecture courses, and finaly say no to architecture consultants. If you followed my advise so far then the next step is to tourist your business and all the things it depends on. Be sure to talk to people, see all the sights and take time to get into the the daily dealings of the residents. Would it be the case that you happen to pack a camera, notebook and a pencil, then by all means try to jot down some memorable moments. When the tour is done take some time to reflect on what you have experienced and all the things you saw. After this trip it is time to book some visits with people who can help you dig deeper into the understanding of the business. At these visits your task is to relate your understanding of what you saw during the big trip so that any missconceptions can be corrected, be sure to add into the story your reflections. If by chance you come out of this with a good understanding of all things your business then you can start architecting changes and designing solutions. Almost one and a half year since I wrote anything on this blog. I’ve spent that time to participate in creating a spark that ignited people to change how they view their opportunities in business. From this initial spark was created a network or perhaps movement is the more appropriate word that has grown ever since and now supports people in reaching their business goals. I’ve reflected a lot during this time, mostly about myself and how my actions and inactions influence the direction of events. The insights gathered from this reflection has seriously changed the way I participate in conversations and brought about a much higher input vs output ratio. When earlier I was spontaneous and quick to act I’m now far more tempered and careful about my contributions. Except for being part of creating the spark and continuously supporting the effort to keep the fire alive I’ve been deeply involved in several consulting gigs. Each one more challenging than the next and almost always centered on aligning people around important decisions, facilitating a journey to find a vision or coaching teams so that they are strong enough to survive and thrive under demanding situations. All of this and the lesson learnt from it boils down to the one basic belief that democracy is the only way forward. We are analog beings living in an analog reality playing with digital representations, errors will fuel the transformation. There is a huge gap in insight as to what a digital business really is. Today when I hear business leders talk about going digital it’s mainly revolving around four scenarios. The first scenario is to connect all the systems together though some sort of integration. The second scenario is to reach the customer via apps over channels like smartphones, webb and make the experience omni. The third scenario is to automate as much of the work as possible via some sort of BPM effort. The fourth scenario is to put things in the cloud. All four scenarios are valid efforts and should be taken into consideration as they will build a foundation for what needs to be. However this is not what defines a digital business. Truly going digital means operating the business through a digital representation and this means that the models in the business repository has to (inter)face with reality. Principle #1: Don’t put anything in the repository to which you cannot attach a realtime data stream. Why: All the things you have in the repository is a logical representation of something that is a real thing in a business perspective. Not collecting and displaying data from that real thing and associate that with the logical representation means that you really don’t have a clue about what is happening, what could happen and what will happen. To put it bluntly – you are just playing in the sandbox. How: Attach the Customer, Financial, HR, Change and Production data streams to your repository, filter out the things that you need to display with the model element and put the rest on a query basis. What: Use of complex event processing, analytics and decision support over the data in the repository means that early signs of change should be detected and action can be taken directly with a full insight into the consequence. Having this capability means that the business will become more efficient. On the inside you will have to redesign your workflows as they could now become automated by large and further the digitalization of the business. Outcome: The business is agile, predictive and profitable in proportions never experienced before. Don’t be scared, level zero in a capability map is just a way to structure the map so that we have a consistent way of communicating. It’s really not that important if all you wish todo is create an excellent set of capabilities for your business. However if you are intent on changing the foundation of your business then level zero is absolutely imperative to get right. Capabilities and capability maps are not organization structures, they do however serve as a powerful instrument when one need to create an organization architecture, in fact they are best thought of as organizing structures. Are these patterns better than any other pattern one may ask and the answer is that they are not. There is probably more than a enough patterns to this problem of layout if you Google for capability maps. It’s just that I’ve used these patterns a lot and have seen others use them and have found them to be highly effective to influence the future of a business. 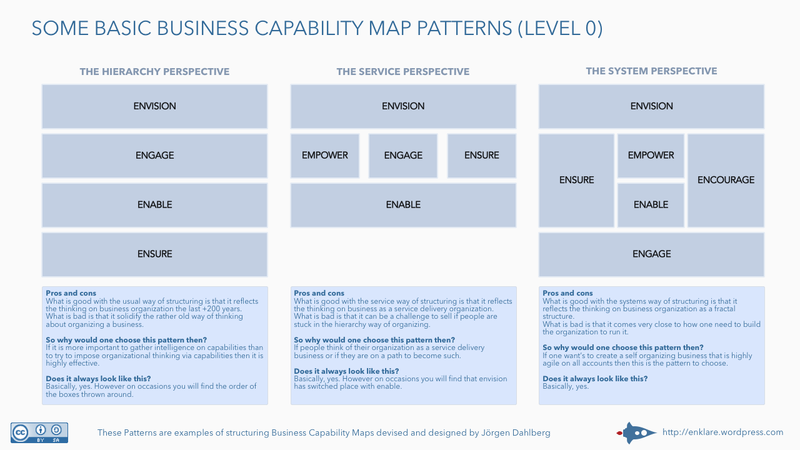 Remember that any business capability map can be reordered into any of these patterns, so do not let the choice of pattern for level zero stop you from investigating what is important. The system perspective is highly influenced by the viable systems model created by Stafford Beer and the OODA Loop created by John Boyd. You will be able to download the presentation here. It’s never been as important to reach outside of the business as it is in the digital world of today. 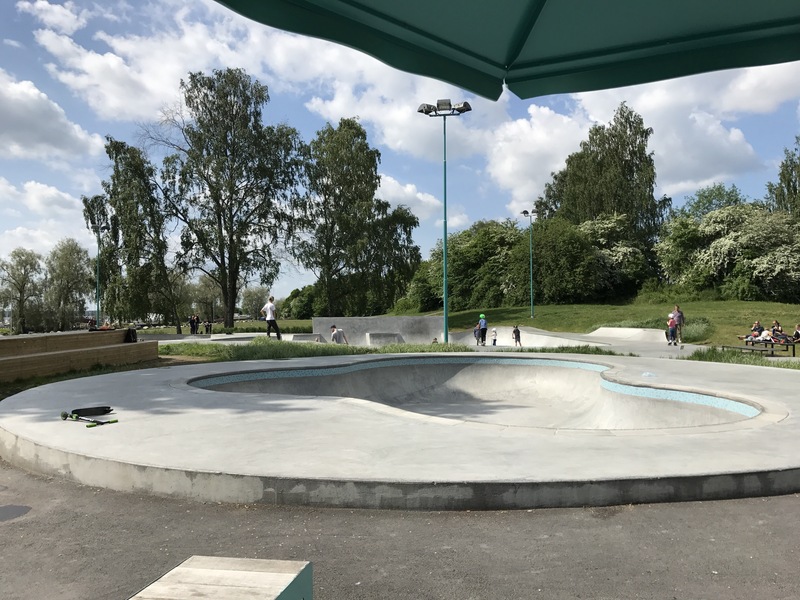 From an architects perspective it is vital to be able to connect the dots between what is servicing and who is being served. This little card is designed to help you go fast by staying small and keeping it nimble. 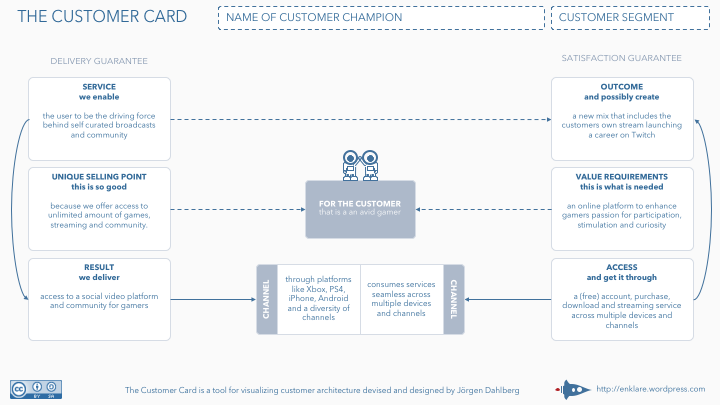 The design of the card does some heavy lifting by tying the outside to the inside through services and value requirements. This Customer Card contains an example to make it easier for others to use the template card. Whatever business you are in innovation is the name of the game. Today it’s even more important than ever that you innovate fast and somewhat accurate. This little card is designed to help you go fast by staying small and keeping it nimble. I’ve had this outline of a book project laying dormant on Google drive for a couple of years. The working title was “The Art of Documenting Enterprise Architecture”. I’m not to fond of that title since I wasn’t aiming to document an architecture, rather capture and think through questions one would need answered to get insight into what the enterprise is all about. There is no guarantee that I’m ever going to finish this post but the thing written a couple of years ago is still valid so I thought I’d publish that part here. Many misread the depiction of the integrated view above. People ask – why is strategy closer to mission than vision? Why is tactic above strategy? To clarify this predicament it should be clear that the order one should read the integrated view above is starting with vision and then ends and then mission and lastly means. That closes the outer iteration and gives guidance to reading the inner iteration which start with goal and then objective and then strategy and lastly tactic. The world is complicated, it may even be downright complex sometimes. We all know this, but what we don’t always recognise is that we don’t need to bring that into the formulation of the basic questions we seek to answer. Are we the right people doing the things we do? Are we doing the right things well? Are we receiving the expected yield? Are we happy doing the things we do? The first of many small steps is usually the hardest to take. The second of a thousand steps is barely noticeable. The third of a million steps is forgotten. The last step of any walk determines if you will reach the target, yet the last step is rarely remembered. Any journey started must have an end; it cannot be that we journey without end. Time is the only resource with a direction and it points ever forward. We can only travel through time using our memory as the machine that displays the wonders that has happened before hand. Yet even if we may be at arm’s length in our minds we can still not change that which has happened, best then to plan for the future that has already happened. The purpose of these questions is to gather and structure data into what has happened. That data could be used in a diagnosis phase to gain insight into what could possibly be expected in the future from the Enterprise. What values lie behind the way the Enterprise operate and to what extent are these values visible on a daily basis? What cultures are active in the Enterprise today? What core principles are there? What behaviours are rewarded in the Enterprise? How have these cultural components shifted over time? Who has owned parts of the Enterprise and to what extent? Why did they own parts of the Enterprise? How has the ownership changed during the years and when did that happen? What events has affected the Enterprise and to what extent? Why did they affect the Enterprise and how have they changed the Enterprise? What markets has been targeted by the Enterprise and what was the outcome? What was the investment made in those markets? What was the purpose behind targeting those markets? What offers/products/services where made to those markets? What markets has been considered but then not entered into? What have been offered to the markets in terms of products and services? What was the purpose behind this particular selection and what was the outcome? Is there products or services created that where later decided against putting on the market and what was the reason behind that decision? What immaterial rights (IR) have the enterprise held and what IR do they hold today? What is the direction on IR today? What locations have the enterprise operated at? Where is the enterprise operating today? Under what permits and regulations have the enterprise operated? What permits and regulations are in play today? What was the purpose behind these particular selections and what was be the outcome? What insurances have the enterprise opted for? What disputes have the enterprise been involved in? What was the reason behind this particular dispute and what was the outcome? What agreements have been entered into by the enterprise? Why where they so important and what was the outcome? What has been the most important customer segment? Why where they so important? What was the outcome for those customer segment? What customer segments is in play today? Who has been the most important partners / suppliers? What was the outcome from those relationships? Who have been the most important competitors? What was done to win over them and what was the outcome? How many employees have there been over time? What key skills did they possess? What was the purpose of having those employees and what has been the outcome so far? How many managers and managerial roles have there been over time? What was the purpose of having those managers/roles and what has been the outcome so far? How many board members have there been? Who where these board members? What was the purpose of electing those board members and what has been the outcome so far? How has the profit and loss evolved over time? What was it that effected the P/L to develop like it did? What revenue streams have the Enterprise had? Many of us have spoken of strategy and tactics and even more have listened to the words being uttered as a vision for some important change. Few have given thought to the true meaning of the words and even fewer have tried to alter their use of the words. It should be clear that in this post I refer to a strategy as a description of a way forward, it contains the general characteristics of the path we would like to travel if all unfolds according to plan. A tactic on the other hand is a detailed recollection of the actions and events that follow the course of a strategy. 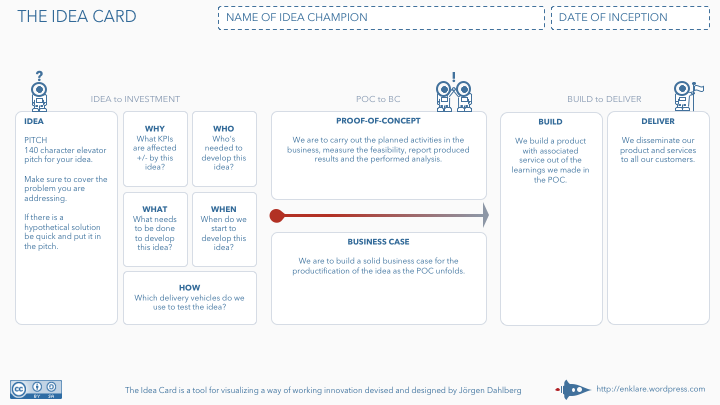 The purpose is to find the questions that would capture the strategy as concepts used in the enterprise. 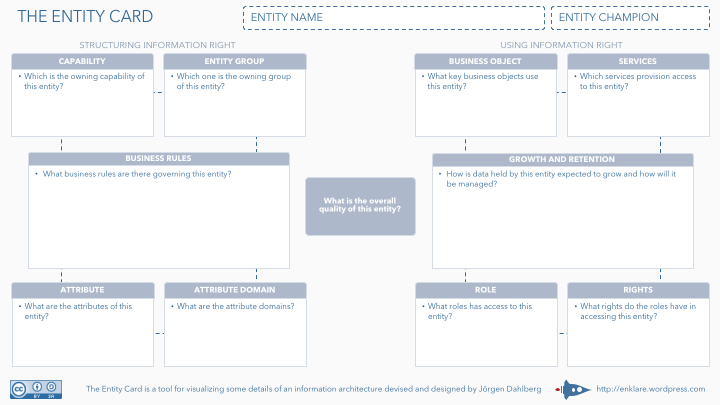 The purpose is to find the questions that would capture the tactic as concepts used in the enterprise. There seems to be as many ways of talking about capabilities as there are ways of putting a shoe together. To add to the confusion functions, processes and other concepts of enterprise architecture is widely used as capabilities. Here we refer to capabilities as the core skills that we must master as a social system (the organisational level). In asking questions about the information we need to look both where we are and where we could be. What common terms & definitions? What meta data and master data? In asking questions about the technologies we need to look both where we are and where we could be. Where use custom development, standard applications, utility services? Which communication (Integration, Service Orientation…)? Whatever business you are in, information is the most important raw material there is and it should be understood by many. Using tools like the entity card is one way of communicating on relatively stable information structures, there are other ways. People may say this is hard and takes a lot of time todo. To them I would recommend that they think about the basic information used in the business and evaluate for how long the average entity has been around. My experience is that most entities within a business domain has been around at least +80% of the lifetime of that domain. Changes to the entity is almost always on business rule or attribute details. License This work is licensed under a Creative Commons Attribution-ShareAlike 3.0 Unported License. The rise of the experience economy have brought with it accelerating developments in organizational patterns, business models, software, hardware and algorithms. Taken together it points the way to something new about how the enterprise architecture profession needs changing. The skills of the new ways of working vary, but they are all examples of how the momentum in enterprise architecture must shift away from “theoretical modeling”, “information hoarding” and “static planning”, toward things that truly live in the real world of modern business. In business it all starts with things that we observe, thats future uncertainties, and things that we orient our selves on, thats unfolding factors and things we decide on, thats current situation. The responses we make to these insights are how we act in the real world. The illustration is the OODA graphic from Boyd’s 1995 lecture “The Essence of Winning and Losing,” as reproduced and explained by his associate, Dr. Chet Richards, in his book Certain to Win. The emerging situation requires new ways and the use of new toolsets adapted to the world at hand. One immediate response to the emerging situation is to start continously exploring large sets of cross domain data in solving the complex whole system problems that business execute in. That kind of work requires involvement of people from all areas of business like demographics, politics, markets, environment, sales, marketing, research, finance, legal, management and computer science, and the use of advanced technology. IBM has with its Watson for analytics released services that can be used to analyze cross domain data in a rather intuitive way. Others, like SAP with Lumira, SAS with Visual Analytics and Microsoft with Power Bi are all great tools. If you want to dive deeper and get your hands all the way into the source then R and the various tools around that is awesome. William Gibson said that the future is already here – it’s just not evenly distributed. In the field of enterprise architecture that rings true.